Sometimes, the yellowing of tomato leaves is natural and not a cause of worry, but sometimes, you need to pay attention. Yellowing could indicate something as silly as too much water, but if your tomato plants are under a pest attack, it could turn ugly. There are many things that can make tomato leaves turn yellow: under or over-watering, a nitrogen deficiency, pests, or a possible disease are among the most common. Some are easy to fix and some are more tricky. If it’s your first time growing tomatoes, mysterious problems can affect your confidence. Many people give up if their first crop fails. Don’t quit! Determine the problem and learn how to fix it so that your next crop grows well. Growing tomatoes or any other plant to perfection is a matter of skill, and all skills need to be developed. 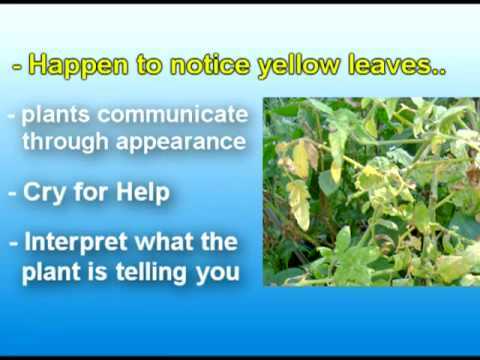 What Makes the Tomato Plant Leaves Turn Yellow? Why are there brown, gray, and yellow spots on my tomato plant’s leaves? Below, you’ll find the signs of and solutions for an infestation. It could be an imbalance of nitrogen, minerals, alkalinity, etc…. see below for diagnoses and solutions. If you can move the plant to get more sun, then do; if most of the plant is unaffected, don’t worry about it. It’s a normal stage of the growth cycle. Excess Moisture. Tomato plants need perfect soil moisture levels. The soil shouldn’t be too wet nor too dry—always maintain the Goldilocks level. Determine how much water is needed by taking your weather conditions, the soil type, and the level of mulch you use into account. In some places you’ll need to water multiple times a day, but in others, watering just a few times a week is fine. Root Rot is one of the possible outcomes if you overwater potted tomato plants. When the roots of the plant are flooded with water for extended durations they cannot breathe anymore. This lack of oxygen causes the plant tissue to die and eventually decay. The decayed sections of the root spread and in time results in the death of the plant. There are two possible causes to root rot, one is overwatering and the other is the root rot fungus. The fungus usually lies dormant in the soil and turns active only in prolonged and very moist conditions (such as overwatering). Flooding just once could be sufficient to turn this dormant beast active. But rest assured, this is not a problem you cannot easily solve. All you need to do is gently uproot the plant and inspect the roots for decayed sections. If you spot such sections, you can conclude that the yellowing is caused at least in part by root rot and not entirely by some other factor. Once root rot is confirmed it’s best to wash the roots of the plant under gentle cold running water to get rid of all the soil. You may notice some of the decayed sections of the root fall off as well. After carefully washing, use a shear to chop off any mushy black sections of the roots before washing again. Next place the roots in a gentle fungicide to kill the fungus causing the problem (if any). It’s best not to place the plant back into the same soil. Throw away the soil and wash the pot with bleach before adding new soil and fertilizer. For more on perfect watering techniques, I suggest checking out my article on watering tomato plants. Compacted Soil. The first time I planted tomatoes, I planted seeds directly into the ground, skipping the nursery stage. This resulted in the plants turning yellow when they were around a foot tall. After some research, I found out that the soil wasn’t aerated well enough and it was too compact. The plants recovered after I dug up and loosed the soil a bit, which gave them enough room to spread their roots and breathe. Septoria leaf spot, or Septoria lycopersici, is a fungus that causes gray or brown spots surrounded by yellowed areas, and usually starts at the lowest leaves. Do what you can to reduce moisture in the area by removing affected leaves, watering the soil without wetting the leaves, and doing what you can to increase air movement to help evaporation. Be careful not to cross-contaminate. Use a fungicide. Early blight, a fungus called Alternaria solani, appears on the lowest, oldest leaves first. It looks like little brown spots with concentric rings that form a “bull’s eye.” Eventually, the leaf turns yellow, withers, and dies. Treat as you would Septoria leaf spot. Bacterial wilt, aka Ralstonia solanacearum, is a soil-borne bacterium common in moist, humid, sandy soils. It moves quickly up from the roots to the stem. Remove and burn the affected plant so the bacteria doesn’t spread. Verticillium wilt from Verticilliurn alboatrum, a soil-borne fungus that lives in many cool Northeast gardens. It starts as yellow patches on the low leaves and progresses to brown spots and curled, dead leaves. The best way to make sure that the plant is affected by Verticillium wilt is to chop off the branch that shows these symptoms and look for dark coloured rings. Pests. Pests can be controlled using predators or other natural methods. Pests are not always obvious—you may need to look closely at the stem or turn over the leaves and search to find them. I’ve seen white insects (mealybugs) and aphids. Soapy spray gets rid of mealybugs and ladybugs feast on aphids. You may want to search for natural ways to get rid of mealybugs if you’re going the organic route. Imbalanced Alkalinity: Is your soil pH acidic or alkaline? Tomato plants need the right pH range for successful absorption of nutrients. You’ll need to add a little fertilizer, but don’t over-fertilize, which leads to high pH. Lack of Nitrogen: When there’s a deficiency of nitrogen, the older leaves at the bottom usually turn yellow whereas the upper, new leaves remain bright green as though there’s no problem at all. However, you’ll notice that the overall growth rate drops and your tomato plants will be shunted. You could add urea or ammonium to the soil or any other form of manure. If you observe any plant, eventually you’ll see the older leaves wilt and die. Similarly, your tomato plant will also have yellow leaves at the bottom. This is a normal stage of the growth cycle. Also it could indicate a lack of sunshine due to shading by the higher leaves. As long as the plant continues to grow healthily and produce fruits, you need not worry. This could indicate Septoria leaf spot, a soil-borne fungus that affects the leaves but not the fruit. It’s a common issue with tomatoes, especially in wet, humid areas. It usually starts at the bottom of the plant with the oldest leaves and moves up. You might see darker spots surrounded by pale yellow areas that may eventually turn completely yellow or brown and die. If you look further up this article you will see a picture which you can use to help identify the problem you are facing. Are older leaves turning yellow? This may not necessarily be a problem. You could check out the list of points already covered earlier. But, if the new leaf fonds open up to be yellowish, it’s most likely a nutrient deficiency. Fungal attacks usually affect the entire plant at a time or go from the bottom to the top. Tomato plant leaves do not begin by turning brown unless it’s a fungal attack such as Septoria leaf spot or other fungal infections. So, if you notice your leaves turning brown before they go yellow you should look for a solution as soon as possible. The helpful points above are definitely going to help you out. The death of leaves on a plant is quite natural and not a reason to worry. The lower leaves that no longer receive sun light usually wilt and die as they are useless to the plant since they are just consumers and not producers. As long as you see some healthy foliage at the top of the plant you don’t have to think twice about it.